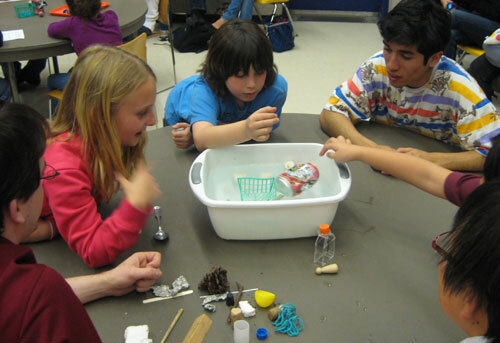 For some time, the science education community has advocated an inquiry-driven, highly participatory approach to teaching science, and research has suggested a number of related "best practices" for effective instruction of elementary and secondary students. Yet in the preparation of university undergraduates who major in science, and in teacher preparation and continuing education programs, these best practices, even when advocated for by the program, are often woefully absent from the manner in which the courses are taught. In many cases, participants are lectured about how they shouldn’t lecture. The Communicating Science course, developed by staff and science faculty members from Lawrence Hall of Science and UC Berkeley, helps to address this paradox. The course has been designed with learner centered practices and sound educational principles at it’s core, and the strategies advocated for teaching with children are also employed in teaching the course with adult learners. Not only does this benefit the participants as they learn the pedagogical content themselves, it also provides consistent modeling of the strategies in action, increasing the chances that participants will implement them when they teach. Begun as an innovative science teaching methods course for university science students, the Communicating Science course has continued to evolve and has also been shown to be a highly effective and engaging platform for a number of different audiences, purposes, and educational settings. In 2005, Communicating Science won UC Berkeley’s Educational Initiatives Award for its innovative design and is now widely recognized as a model for combining theory and practice to promote effective teaching strategies for improving science literacy. Communicating Science, and similar courses based on it, Communicating Ocean Sciences and Communicating Ocean Sciences to Informal Audiences are currently being taught at over 25 colleges and universities nationwide. Various combinations of sessions from the course have also been implemented in hundreds of teacher workshops and institutes, both nationally and internationally.